We are proud to present the 4th Annual Bow Wow Film Festival! Come join us for this fun event to celebrate our beloved canine companions! This year we have another rousing, fun loving show so please join us for a delightful evening out to celebrate our beloved canine companions and all the richness they bring to our lives! We are so excited about the movies we have chosen for our 2018-19 Tour! A few highlights for this years films; we have movies about working dogs, both old school and new school, we have the return of the delightful Ask Frank and his advice column and we go international with movies filmed abroad! Come laugh and cheer and maybe even tear up a bit as we marvel in all the ways these beloved furry creatures touch our lives! Tickets are $12 in advance or $15 at the door for adults. Tickets for children 12 and under are $8. Doors open at 6 pm and movies will start at 7 pm! Come early to enjoy giveaways and vendors! All ticket proceeds will benefit the marvelous work of the Oregon Humane Society. 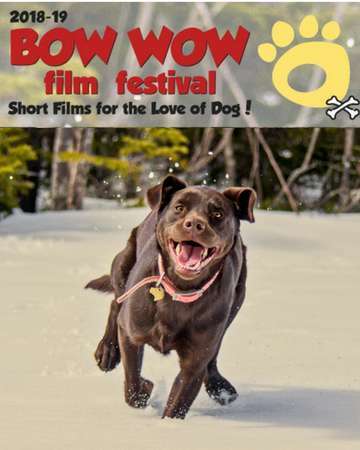 Bow Wow is a traveling film festival that celebrates, educates and inspires all things doggie (with or without their human) through the art of short film. Bow Wow Film Fest features some of the year's' best pooch themed short films all wrapped up in one beautiful, fun-loving package! Bow Wow presents an opportunity for animal welfare groups to host an event that generates awareness as well as offers a unique and delightful way to fundraise.